The story of the Jefferson Dad Vail Rowing Association must begin with mention of two men, “Rusty” Callow, then coach at Pennsylvania, who laid the foundation, and Lev Brett, the architect. “Rusty” furnished the idea of promoting competition among colleges struggling to found rowing. These fell into two classes: those too small ever to hope to compete in the “big time,” and those larger institutions not yet ready for such competition. To furnish the incentive, “Rusty” put into competition in 1934 a trophy which he named in honor of his friend Harry Emerson “Dad” Vail, for years coach at the University of Wisconsin. Hence our name. 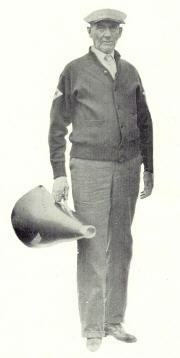 Mr. Vail, aged 69, was the oldest crew coach in the U. S. at the time of his death. Jim Ten Eyck of Syracuse was the only one who exceeded “Dad” in age. Coach Vail was “Dad” to every boy who ever worked under him, and he was one of the most beloved figures on the university campus. Coming to Wisconsin in 1911, Coach Vail almost won the Poughkeepsie title that year. Again in 1924, following a ten-year period in which the University of Wisconsin authorities refused to send the crew east, “Dad” took second, and his praises were sung from one end of the country to the other. Deeply religious, “Dad” Vail was one of the few coaches taking crews to Poughkeepsie who refused to do any rowing on Sunday. Gradually, other coaches followed the lead of the Wisconsin mentor and until now it is quite unusual to see an eight swinging down the Hudson on Sunday. Coach Vail was possessed of an inimitable sense of humor, and some of his stories will survive as long as eights with the long sweeps are propelled over Lake Mendota. As long as rowing is discussed, there will be those to tell of the feats of “Dad” Vail when he was one of the greatest single scullers in the world, of his uncanny ability in sizing up a crew, and of his flashes of biting sarcasm. Previous to his work at Wisconsin, Coach Vail had been coach at Georgetown Prep, Ariel Boat Club, and Harvard. However, it was through his work at Wisconsin that Coach Vail became widely known. Harry “Dad” Vail was a great coach, who year after year kept Wisconsin in crew. He was little recognized away off there in Madison. He was such a grand spirit, with a spiritual nature, a man of infinite patience and good character. And he knew rowing. I recall once when I was coaching at Washington in ’26 or ’27 we stopped at Madison to row the Badgers on our way to Poughkeepsie. “Dad” Vail had only a fair crew. He told me that his crew’s showing against the Huskies spelled whether or not his Wisconsin crew would go to Poughkeepsie. So I told our coxswain to row around twenty-four and stay beside the Badgers until the last quarter mile, then go up and win by a couple of lengths. They did, and right after the race “Dad” came right up to me, stuck out his hand and said with a warm grip, “Thanks Pal.” We both went on to the Hudson. Dad did have some very fine crews at Wisconsin, but that was not one of them. “Dad” Vail was a lovable character, entirely devoid of secretiveness or slyness, and with a great natural sense of humor. I recall one year observing that he was going up one side of the Hudson River in his coaching launch, and across the river, about half a mile away, rowed his Wisconsin crews. So I asked him: “‘Dad,’ why do your crews go up one side of the river, and you in your launch up the other side? Your lads can’t hear anything you may say.” He replied, “You know, ‘Rusty,’ I’ve found out from experience that the farther off they are, the better they look.” That was “Dad” Vail. There is something gallantly heroic about “Dad” Vail, as standing in his little coaching launch out near Picnic Point he preaches the gospel of rowing to the men in the boats. “Dad” has a hard time of it at Wisconsin. Ile has a harder time than any coach who sends his crew down the four punishing miles of the Hudson in June. He has not the material, or the facilities, or the time other schools have, yet he must race ‘against their crews in June. A heroic figure indeed as he coaches. The tremendous odds he must overcome speak right up on an afternoon out near Picnic Point. A lot has been written about them, but reading does not make the impression seeing them does. This came home so clearly the other day out at the Point. “Dad” had his entire varsity squad out there. A fine bunch of men but nowhere near the hundred or so Fred Spuhn has at Pennsylvania or the seven or eight boatloads of giants “Rusty” Callow experiments with at Washington. There were just sixteen of them in two boats. The inequality of the whole thing as it concerns Wisconsin starts in the boathouse before the men go out. In fact, going back far enough, it starts in the gymnasium annex when “Dad” first calls the men to the oars. Up to a loft he brings them to bend their backs on creaking rowing machines. Wisconsin, lacking a field house, has nothing better in the way of equipment to offer the crew. There are not the fine rowing machines of other schools, let alone the indoor rowing tank, like the one, for instance at Syracuse. Just cramped, stuffy quarters up there in the loft. And the boathouse. It is a ramshackle buildingof wood. It serves its purpose all right of housing the shells Wisconsin has, but somehow it fails to measure up to what others have. Reading this, our coaches must feel that our Association is well named. Here was a kindred spirit, working against the same handicaps most of us have faced in the early years at least, inadequate equipment, insufficient manpower, lack of interest, and often isolation from rowing neighbors to help make possible an adequate schedule. The first of four races before the formation of the present association was held in 1934 with “Rusty” and The University of Pennsylvania as hosts. Marietta College, coached by Ellis MacDonald won the first leg on the new trophy by finishing second to a Penn sub-varsity boat which was an added entry. Rutgers, coached by Ned Ten Eyck, was third and Manhattan, coached by “Skippy” Walz was fourth. At Marietta in 1935, Rollins College joined the field of four competing for the trophy, and there were two added entries ineligible for the trophy, Wisconsin, invited because of the “Dad” Vail connection, and a Pennsylvania crew which was in reality a sub-varsity which “Rusty” billed as the varsity to add interest. With sportsmanship typical of him, when that Penn crew lost, “Rusty” stuck to it that on that day, it was the Penn varsity. He was not the man to detract from the sweetness of the Rutgers victory. The order at the finish was: Rutgers, Penn, Marietta, Wisconsin, Manhattan and Rollins. This was the only Dad Vail race, ever rowed at two miles, and one of two followed by an observation train, the other also being at Marietta in 1941. That 1935 “Mid-American” Regatta at Marietta is a good illustration of the difficulties of those early years, and of the assistance the “haves” rendered the “have-nots.” Of the Dad Vail group, only Rutgers owned anything but hand-me-down equipment. So both the new Rutgers Pococks, the “Lev Brett” and “Ned Ten Eyck” were sent by train, along with four Penn boats, Wisconsin having had its boat smashed to splinters on the way through Chicago. “Rusty” Callow’s sleep on the Pullman was interrupted when the train came to a grinding halt. Next morning at breakfast, when he asked the conductor what had happened, he was informed that a baggage car full of “canoes” had jumped the track during the night, and been left in the mountains of West Virginia. It was a tense Friday at Marietta for crews of six colleges with no boats. When the baggage car finally arrived at dusk it did not contain a load of kindling; the total damage was one bent outrigger. With the lack of organization, the initial impetus generated by “Rusty” Callow seemed to be grinding to a halt. I wrote “Rusty” in the summer of 1938 about what appeared to be an ambitious plan to form a real Association using as a nucleus the colleges which had entered varsity crews in any of the race for the Dad Vail Trophy. A meeting was arranged (That means that Lev arranged it) for January 14, 1939 at the Central Office of Eastern Intercollegiate Athletics and the following individuals were present: William H. McCarter, John M. Harmon, and George Little, Directors of Athletics at Dartmouth College, Boston University, and Rutgers University respectively; Allen Walz and Charles Logg, rowing coaches at Manhattan and Rutgers. I was elected temporary chairman and “Skip” Walz, temporary secretary. Rutgers University: George Little, Athletic Director, Charles Logg, coach, Cuno Bender and Leverich Brett. Manhattan College: Herbert Kopf and Allen Walz, coach. Boston University: George Little, proxy for Doctor John Harmon, Athletic Director. Dartmouth Rowing Club: William Wortherspoon, student president. American International College: James E. Nesworthy, student coach and captain. Marietta College: Charles Jennings and Ellis MacDonald, coach. Richmond University: George Little, proxy for James Littler, captain. Rollins College: Allen Walz, proxy for Doctor U. T. Bradley, coach. A constitution was adopted, and Ellis MacDonald was appointed chairman of the by-laws committee. The first permanent officers were elected as follows: Chairman of the Board of Stewards, Lev Brett; Secretary-Treasurer, Allen Walz. The original Board of Stewards, each member named by the competent authority of his college, consisted of: Lev Brett, Rutgers; Walz, Manhattan; Robert North, Dartmouth; Jennings, Marietta; Nesworthy, American International; Bradley, Rollins. It is perhaps peculiar that often, Dad Vail coaches have served as Stewards. This has been practicable since these colleges usually lacked a body of rowing alumni who were available for such service, and the coaches were often the “Mr. Rowing” of their institutions, in some cases having founded it. In most cases they were volunteers, and sometimes faculty members. As these objectives have worked out, three of our charter members, Rutgers, B.U., and Dartmouth have “graduated” to the “big time” by becoming competitors in the IRA Regatta. Three, being too small ever to compete with the big boys, have remained active Dad Vail members, A.I.C., Marietta, and Rollins. Two, Richmond and Manhattan, dropped rowing. A significant fact is pointed up by the following statistics: in the first association regatta seven colleges sent seven varsity crews to Red Bank. At Philadelphia in 1961, twenty colleges sent forty crews to compete in varsity, JV, and freshman races. Certainly no member of that organizational meeting in 1939, not even Lev Brett, could have dreamed of such growth.